While studying at SPSAD, it is very important for the student that after he/she gets enrolled student must take his/her username and password for the online teaching and learning. 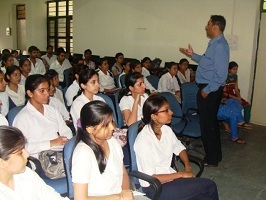 Online teaching and learning is a very important thing what student must do after he/she enters in the campus of SPSAD. To keep in touch with all the academics going on during the coursework and all the recreational activities and extracurricular activities, it is very important that a student must check his/her status on a daily basis so that he/she shall not miss a single thing going on in the campus and off the campus. We update this portal on a daily basis to keep students informed for the same.